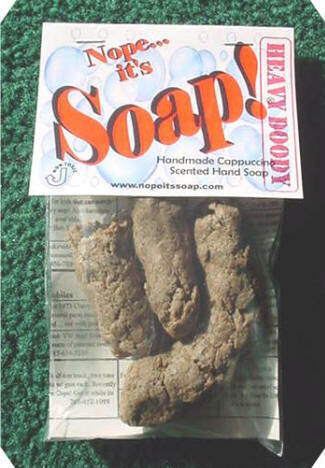 What the world needs now is some soap that looks like dog poop. "Nope It's Soap" claims to have a coffee scent, and can be used as an exfoliator. Got a kid with a dirty mouth? Tell him you're gonna wash his mouth out with this! The manufacturer claims that each bar pile of soap is hand made, and unique, no molds, no mass production. Just like the real thing. It could be funny to play tricks on people with. I wouldn't want the dogs to get in trouble though.